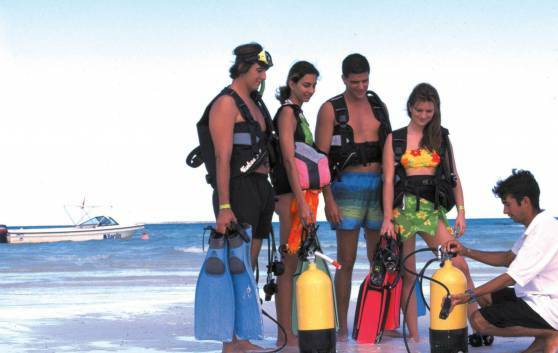 Sol Cayo Coco hotel for scuba diving and snorkeling equipment. Exactly on the northern coast of Cuba, very near the beautiful coral reef stands the Sol Cayo Coco hotel, an 4-star All-Inclusive property surrounded by white pristine beaches and lush tropical vegetation. Cayo Coco is one of the most fascinating keys of the Sabana Camagüey archipelago, also known as King's Gardens. The diversity of its seascapes, the transparency of its water, and the excellent quality of its sand and the captivating enchantment of its coral reefs have made this place famous. The Scuba Diving Center, located a mere 50 m from the hotel, offers a variety of scuba diving packages and initiation courses provided by PADI and SSI - certified instructors.